Love my Chevy Colorado pickup truck. 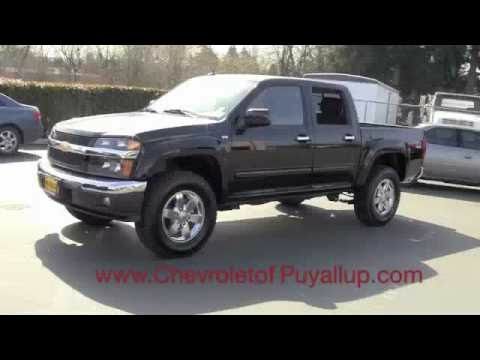 Is a pickup but small enough for me to handle and still have a bed to haul items. Is a 4 door so dogs and or grandchildren can go with me and is a v8 so still have power. I love the ease in driving it and it always looks nice. Even for being a 2011 looks like a new vehicle. The style & looks I can put a lot material inside the bed. I bought this truck 7 years ago very reliable I have had no major problems. The only thing I wish I would get better gas mileage. My next trick I will shop around. My body is holding up fine I keep the truck outside. I would buy another Chevy Colorado truck. GENERAL MOTORS IS RECALLING CERTAIN MODEL YEAR 2011 CHEVROLET COLORADO AND GMC CANYON PASSENGER VEHICLES EQUIPPED WITH A 2.9 OR 3.7 LITER ENGINE AND A FOUR-SPEED AUTOMATIC TRANSMISSION FOR FAILING TO CONFORM TO THE REQUIREMENTS OF FEDERAL MOTOR VEHICLE SAFETY STANDARD NO 102, "TRANSMISSION SHIFT LEVER SEQUENCE, STARTER INTERLOCK, AND TRANSMISSION BRAKING EFFECT," AND FEDERAL MOTOR VEHICLE SAFETY STANDARD NO. 114, "THEFT PROTECTION." THESE VEHICLES MAY HAVE BEEN BUILT WITH AN AUTOMATIC TRANSMISSION ADJUSTMENT CLIP THAT MAY NOT RETAIN THE SHIFT CABLE IN THE CORRECT POSITION. IF THE SHIFT CABLE IS NOT IN THE CORRECT POSITION, THE PRNDL SHIFT LEVER MAY NOT ACCURATELY REFLECT THE POSITION OF THE TRANSMISSION GEAR. THE DRIVER COULD MOVE THE SHIFTER TO "PARK" AND REMOVE THE IGNITION KEY, BUT THE TRANSMISSION GEAR MAY NOT BE IN "PARK." THE DRIVER MAY NOT BE ABLE TO RESTART THE VEHICLE, AND THE VEHICLE COULD ROLL AWAY AS THE DRIVER OR OTHER OCCUPANTS EXIT THE VEHICLE OR HAVE EXITED, RESULTING IN THE POSSIBILITY OF THE VEHICLE STRIKING THEM OR SOMEONE AROUND THE VEHICLE, OR COULD RESULT IN A CRASH WITHOUT PRIOR WARNING. GM DEALERS WILL INSTALL A NEW AUTOMATIC TRANSMISSION ADJUSTMENT CLIP FREE OF CHARGE. THE SAFETY RECALL IS EXPECTED TO BEGIN ON OR ABOUT JULY 19, 2011. OWNERS MAY CONTACT CHEVROLET AT 1-800-630-2438 AND GMC AT 1-866-996-9463. GENERAL MOTORS IS RECALLING CERTAIN MODEL YEAR 2011 CHEVROLET COLORADO AND GMC CANYON VEHICLES MANUFACTURED FROM SEPTEMBER 22, 2010, THROUGH NOVEMBER 5, 2010. SOME OF THESE VEHICLES HAVE THE CONDITION IN WHICH THE WINDSHIELD WIPER MOTOR CRANK ARM NUT MAY NOT BE TIGHTENED TO SPECIFICATION. WHEN THE WIPERS ARE OPERATED WITH A BUILD-UP OF SNOW OR ICE, OR IF THE WIPERS ARE OPERATED ON A DRY WINDSHIELD, THE NUT COULD LOOSEN. IF THERE IS SUFFICIENT LOOSENING OF THE NUT, THE WIPERS COULD BECOME INOPERATIVE. DRIVER VISIBILITY COULD BE REDUCED INCREASING THE RISK OF A CRASH. DEALERS WILL SECURE THE WIPER MOTOR CRANK ARM NUT FREE OF CHARGE. THE SAFETY RECALL IS EXPECTED TO BEGIN ON OR BEFORE MAY 11, 2011. OWNERS MAY CONTACT CHEVROLET AT 1-800-630-2438, GMC AT 1-866-996-9463 OR WWW.GMOWNERCENTER.COM.